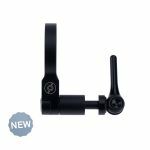 The new universal, solid and elegant handlebar mount is designed for cyclists who want to install their lights centrally on the handlebar. With its innovative, split pivot clamp can mount the holder on both sides of the handlebar without having to remove a handle, shift a lever or brake lever. All Supernova front lights without integrated handlebar support can be optimally positioned in from of the handlebars with the Universal HBM. Its also ideal for mounting the new MINI2 and M99 MINI front lights.